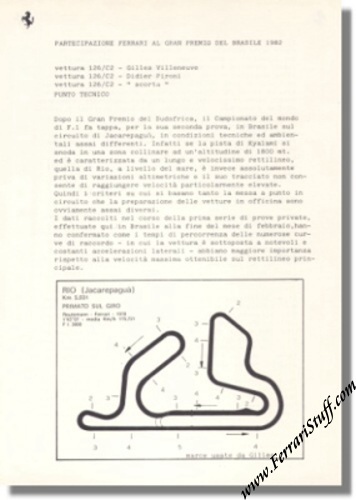 Vintage 1982 Ferrari press release on the Grand Prix of Brasil held at Rio de Janeiro (Jacarepagua). Mentions that Gilles Villeneuve and Didier Pironi will be driving the Ferrari 126/C2. Contains quotes by Marco Piccinini and Gilles Villeneuve. Also shows a map of the Rio track with the gear shifting points. Gilles qualified in second place but spun off in lap 29. Didier qualified 8th and finished in 6th place, 1 lap behind winner Alain Prost.